Taking the horror genre as its theme, Haunted House is a traditional three reel style slot game, with five paylines and a theoretical return to player percentage of between 95.49% and 96.71%, depending upon players’ gameplay choices. Featuring traditional horror characters and images, including vampires, bats and crucifixes, Haunted House keeps things simple when it comes to gameplay and doesn’t include any features or elements beyond its main game. 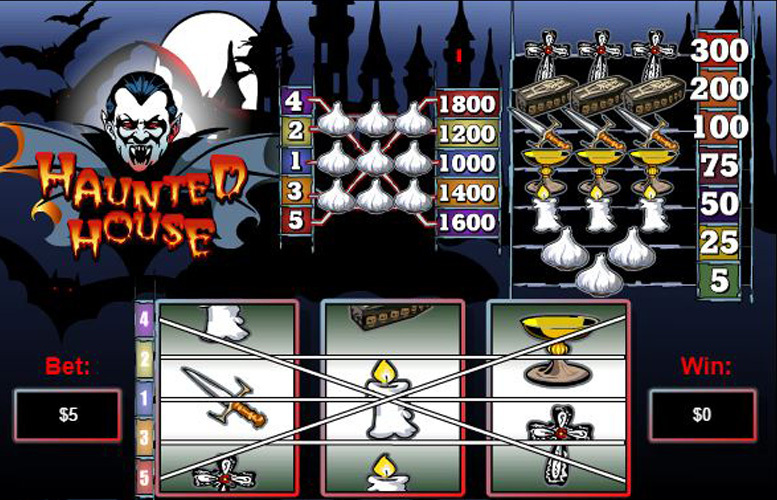 Haunted House is incredibly easy to understand and to play, and will appeal to those with little time or with little previous experience of slot games. The top payline jackpot of £36,000 is one of the highest offered by any traditional three reel style slot. Other payouts below that top jackpot remain at an impressive level and do not drastically fall away in value, as is the case with some slots. Due to the lack of a bonus round, sidegame, scatter symbols or even a wild, Haunted House gameplay is very repetitive and may lead some players to quickly tire of the slot. Haunted House’s graphics and images are also a little simplistic and limit the slot’s visual impact and appeal. It is unquestionably the symbol depicting a clove of garlic which Haunted House players will most want to see appearing on the slot’s reels. The game’s five highest jackpots, after all, are triggered by a three garlic symbol combination. The exact jackpot resulting from the combination depends upon which of the slot’s five paylines the three garlic symbols appear along. Along payline number one, the jackpot will be worth 1000 times the chosen line bet. The size of the jackpot the increases in increments of 200 up to the 1800 times the line bet payout available for three garlic symbols appearing along payline number five. That is the slot’s overall top jackpot and at the highest possible line bet option of £20, is worth a tasty £36,000 to players. Just like a vampire’s reflection, Haunted House’s additional game features are non-existent. The reels do not include wild symbols, scatters or any other type of special symbol, and there is not a sidegame or bonus round. Whether that is a strength or a weakness of the slot, however, is very much up to each individual player and exactly what it is that they typically look for from a slot game. All of the symbols on the Haunted House reels take the horror genre, and more specifically the world of Vampires, as their inspiration. As we’ve already explained, it is the garlic symbol which makes up the slot’s five most valuable payline combinations. What’s more, seeing two or even just one garlic symbol appear along a payline also results in a small payout every time. The most valuable symbols after the garlic symbol, meanwhile, are the symbols depicting a crucifix, a coffin and a gilded dagger. Three of the crucifix symbols aligned on any active payline results in a jackpot worth 300 times the player’s chosen line bet. Three of the coffin symbols similarly aligned pay out at a rate of 200 times the line bet. Three dagger symbol combinations, finally, trigger jackpots worth 100 times the line bet. Haunted House players have a couple of options when it comes to altering the amount they wish to wager per spin. Firstly, they can choose whether they wish to have one, two, three, four or the maximum of five paylines active for the spin. Secondly, they can then select how much they wish to wager per active payline. There are a number of different line bet options available, all falling between the minimum of 1p and the maximum of £20. What all of that means is that the overall Haunted House betting limits per spin are a minimum of just 1p and a maximum of £100. If you’re of the opinion that less is more when it comes to slot games and that slots should be as close to the traditional Vegas style slot machines of yesteryear as possible, then you’re likely to love Haunted House. The game is extremely simple, after all, and does without wilds, scatters, bonus rounds or really any additional gameplay features. What’s more, the slot’s top jackpot of £36,000 at the highest bet level is one of the highest offered by any similarly simple, three reel slot games. If you’re looking for immersive gameplay and modern graphics from your slot games, however, Haunted House will not be for you. Due to its simplicity, the slot’s gameplay is very repetitive and the lack of features also means that there are no ways to enhance payline jackpots and no additional ways to win. This game has a rating of 3 / 5 with 154 total reviews by the users.